Sometimes you just have to buy yourself some spinach, which around here means you buy many many pounds at once, almost more than you can carry but not quite, bound with twine and begging to be cut and rinsed and cleaned. And then, taking advantage of your Palestinian houseguest, you learn a new way to prepare spinach. Then you are so happy because it smells and tastes wonderful, as spinach should. q: why is a crucial tomato like grave danger? a: is there any other kind? 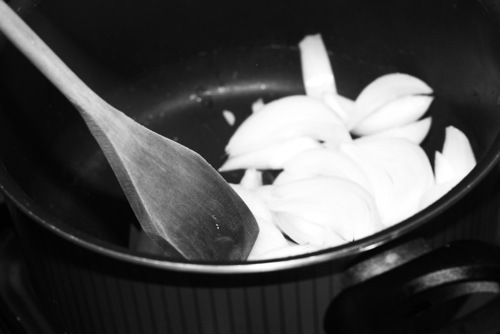 Saute the onion and garlic in olive oil on medium heat for several minutes. Add the spinach with enough olive oil to coat and sauté. 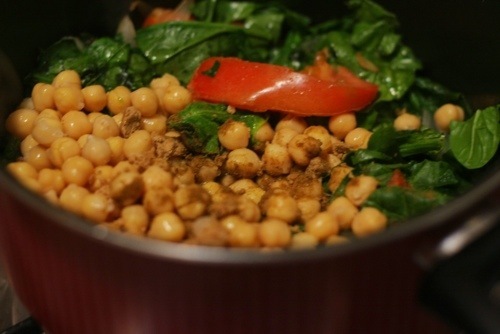 As it begins to wilt, add the tomato, bullion, chickpeas, salt, pepper, and cumin, the cilantro if you’re using it, and a half cup of water, and simmer until fully cooked (probably about 15-20 minutes, but don’t trust me. 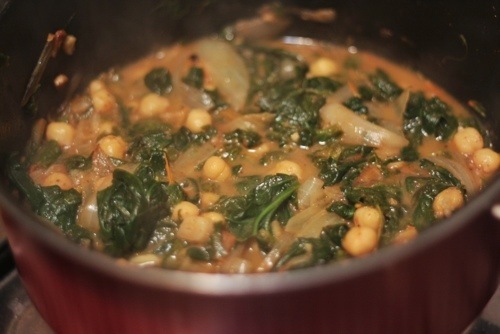 Trust your spinach and chickpeas). Just before it’s done, add a little sumac as well. Best eaten with bread, out of a communal dish – no utensils.